For any society facing a housing shortage the high rise tower block appears to offer the perfect solution. While differing in shape, size and form depending on architectural vision and national priorities, the basic pattern remains essentially the same. Mainly produced using uniform, system built construction methods that utilise pre-fabricated concrete panels, the components are then transported to the building site and slotted into place to form a series of identical concrete boxes. These are then usually stacked on top of each other to form the completed high rise building. As well as being cheap, easy to construct and maximising the use of scarce land in urban areas, such buildings have the added advantage of being modern and rational, two factors which appealed greatly to urban planners the world over in the second half of the twentieth century. In the Russian context, other factors that came into play. The sudden industrial development ushered in by Communist rule meant a huge increase in the urban population and a consequent demand for new housing, leading to cramped, shared communal living in crumbling mansions and other wholly unsuitable buildings. This situation was not helped by the destruction wrought by World War 2 which laid waste to many cities in the Western part of what was then the USSR. These factors combined to give a real impetus to the adoption of high-rise buildings as a quick-fix solution to all these problems. 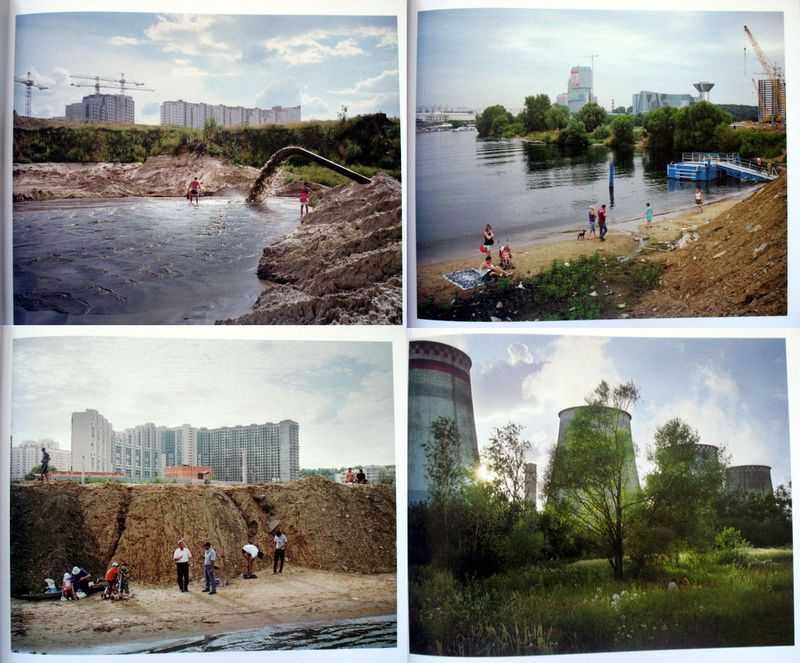 Published by Contrasto in 2013, Gronsky’s book examines the edgelands on the periphery of Moscow, now a thriving 21st century mega-city of 11.5 million people fuelled by the proceeds of natural resource exploitation. Along with St Petersburg, Moscow is a magnet for all those who want to escape the narrow confines of rural Russia which perversely, for the world’s largest country, has led to a shortage of living space. Modernist architects with their dreams of architectural order, liked to produce clean, neat and rational spaces that (they assumed) would produce contented citizens. The reality was very different. Instead of producing utopia, this architectural form created alienation and despair with people cooped up in oppressive grey blocks, identical in all aspects. 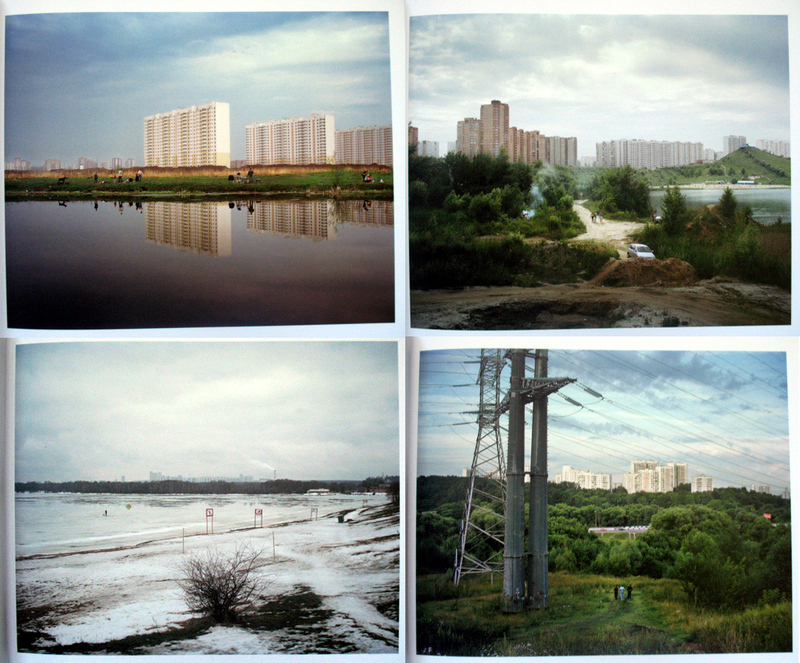 This theme was explored in the 1976 movie The Irony of Fate, a Soviet comedy in which the interchangeable nature of bland architecture is central to the plot: the main protagonist is unable to tell different cities apart because they look exactly the same. Even the street names and front door keys to different apartment blocks were standardised. Naturally, this architectural bleakness is exaggerated somewhat for the movie but it does reflect a deeper malaise about this form of architecture that is common throughout the world. A key aspect in the adoption of this architectural form was the assumption that this rational mode of living would be met with approval by those who dwelt within. However, the evidence is that people react against this imposed conformity at the first opportunity. The scruffy waste land surrounding these buildings becomes a playground where the cramped constraints of communal living can be rebelled against. In previous centuries the artistic representation of the pastoral landscape was an ideal, something to be envied by those living in the dark, polluted cities of the eighteenth and nineteenth centuries. Gronsky shows us a hybrid landscape in which these simplified binary categories no longer apply. Here, amongst the scrawny vegetation and the rubbish, people come to escape the cares and worries of urban life. Through his use of an elevated vantage point and the distance between photographer and the subject Gronsky mirrors the eye of the planner surveying the scene around him. Only instead of the rational, ordered landscape envisaged by the architect, he shows us chaos. In many ways, his photographs are reminiscent somewhat of the artist Pieter Bruegel the Elder who also depicted everyday peasant life amongst the vernacular architecture of sixteenth century Holland. 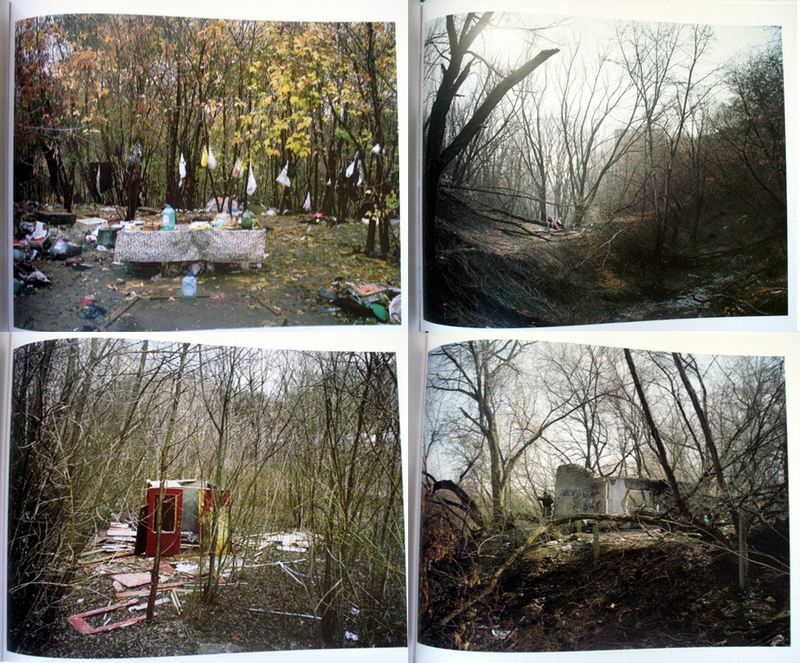 Of course, this visual strategy has also been adopted successfully by photographers since the 1970s, most notably by the New Topographics who explored a tired America on the cusp of industrial decline. 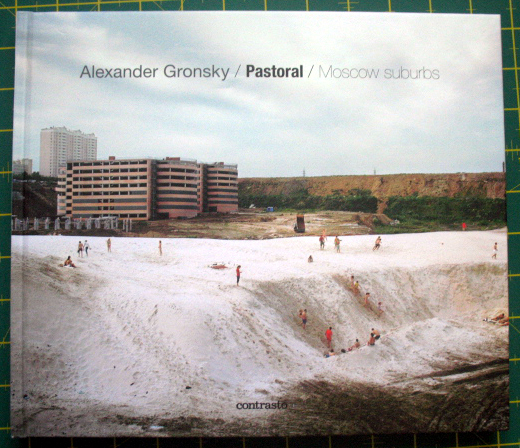 Gronsky’s book does a masterful job in depicting this subversion of the modernist architectural ideal. Amongst the waste ground, bordered by smoking power stations, electricity pylons, motorways, railway tracks and building sites, overlooked by high-rise buildings, disorder and chaos reigns. 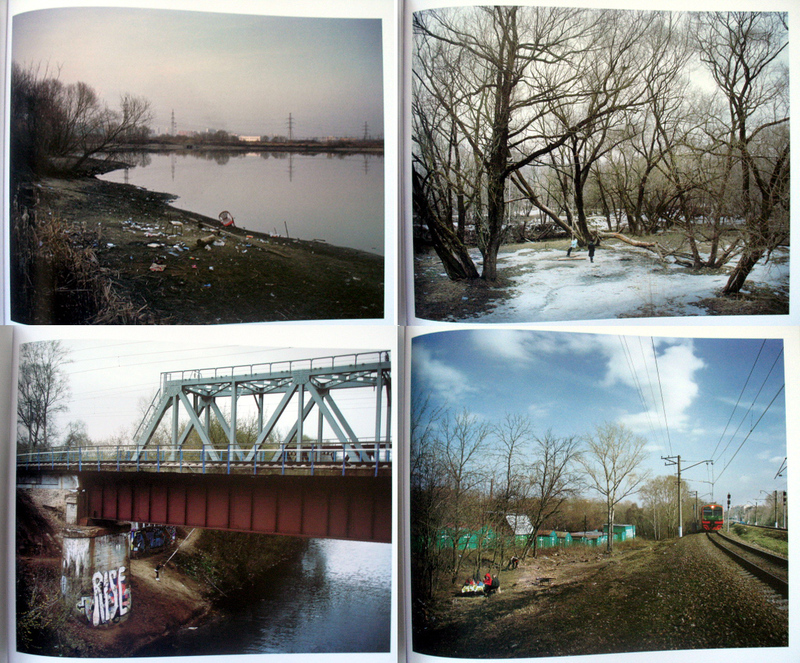 Suffusing Gronsky’s images is an aura of melancholy; perhaps it’s something to do with the national temperament or the legacy of Russian literature which produces this air of viewing people that are trapped in living lives of quiet desperation. 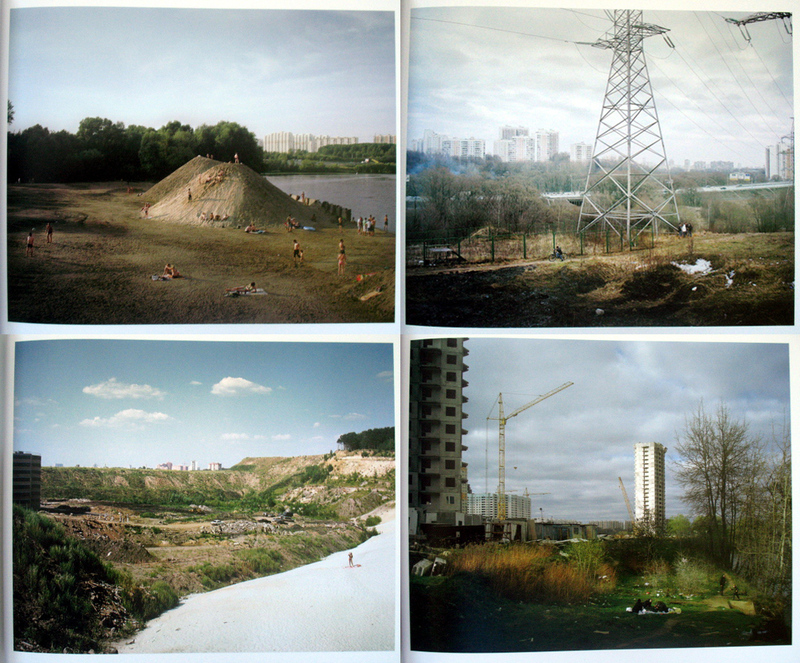 Beginning with the buildings themselves, Gronsky swiftly moves on to the surrounding waste land that is the focus of this book. Here, we see people interacting with a subdued and tattered natural environment; bored teenagers mooch about in the bushes, people go for a swim in a river into which a pipe discharges something that is probably quite nasty, others choose to have a picnic beside the railway tracks or sunbathe amongst the construction sites, two Moslems kneel in prayer, while a macho wanna-be shoots at bottles amongst the scrub. The seasons change; summer turns into winter and the sunbathers move away to be replaced by a snow filled landscape. Throughout, drinking sessions are held in the scrappy undergrowth and the empty bottles, plastic bags and broken chairs are dumped behind. The rusting carcasses of abandoned cars lie submerged beneath the wild nature that is in the process of consuming them. This is a scarred landscape. Everybody uses it but nobody takes any responsibility for it. Far from the utopia the architects and politicians promised us, we have been reduced to living in a hybrid state in which we are the inhabitants of a landscape damaged by pollution and tainted by the ceaseless demands of the construction industry, the vast profits of which grease the wheels of elite groups the world over. In real life, people are not the interchangeable, two-dimensional caricatures envisaged by the sociopathic visionaries or the ego-maniacs with the grand plan. Human nature is far too complex to regiment in this way. This landscape is the inevitable result of architectural and political decisions in which the needs of those who had to actually live in this space were completely ignored.